From the terrible, flesh-eating equus that bedevil the dwarves on the plains of Grak to the mystical ranead who act as messengers for the elven Ancestors, Leorem is a world filled with strange and dangerous creatures just waiting to be discovered. A vast continent filled with unexplored regions, Loerem is home to far more than a handful of races struggling for dominance. It is a land filled with life, from beautiful and mysterious to twisted mockeries of magicks most foul. The Bestiary of Loerem brings 95 new creatures to the gaming table. With new templates, new spells, new magic items, and even new creature subtypes that are distinctly part of the Sovereign Stone campaign setting, the information whithin can also be used to add even more depth and excitement to almost any d20 campaign. Illustrated by the talented black-&-white artist Andy Hopp, each creature comes to life, ready to be used in any campaign. Within, you will also find expanded rules for two of the most unique creatures in Loerem - the dragons and the bahk, both illustrated by the world-famous Larry Elmore. 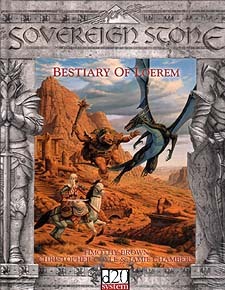 Get ready to immerse yourself in the world of Loerem, read the Bestiary and learn the secrets and mysteries of the wild!